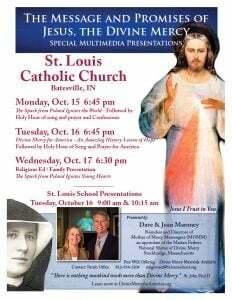 Big Dose of Divine Mercy Coming to Batesville! St. Louis Parish is excited to take full advantage of MOMM’s variety of outstanding multimedia presentations and experience. A visit from Dave and Joan Maroney presents a rare opportunity to evangelize and renew everyone including children, families, the poorly catechized, the most devout, and all in between. This popular, captivating one-hour multimedia presentation takes a leap into the mystical life of St. Faustina and her encounters with Jesus, the Divine Mercy. The fullness of the Catholic faith is expressed through the words of Jesus as recorded by St. Faustina with emphasis on the reality of Christ’s true presence among us today, particularly in the Sacraments and also by means of the veneration of His sacred image. All are amazed to learn of and see the correlation between the original Divine Mercy Image and the Shroud of Turin, a highlight of MOMM presentations for 20 years. Holy Hour – always beautiful and the best way to make the most of the gathering. Once Jesus is exposed on the altar, the priest will make himself available for confessions. Dave and Joan will lead the congregation through adoration hymns, prayers, songs, and mediations before the Blessed Sacrament. The program will conclude with Benediction at 8:45. This powerful presentation chronicles the amazing story of Poland’s journey from darkness to light by means of Divine Mercy. Building upon the basics of the Divine Mercy revelations and devotion, emphasis is placed on how to apply them practically in daily lives to affect spiritual renewal and the salvation of souls in family, country, and world. In other words, it helps one come to understand WHY Jesus came with this message and promises for our generation and how they have been given to us to help us find hope, healing, and victory over evil and sin in these troubling times. 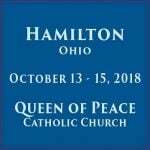 Attendees are offered an opportunity to become part of the Divine Mercy for America prayer campaign and network to help keep them focused on growing in personal holiness and taking full advantage of The Divine Mercy promises. See the ACTION PLAN on DivineMercyforAmerica.org. Every family will be spiritually enriched by this presentation similar to “The Spark from Poland Ignites the World” but geared toward the age groups present and family life. Parents will be moved by the attentiveness and responses the children offer in this interactive program. Each child will receive a 5 x 7 Divine Mercy Image that allows them to fill in “Jesus I trust in You” on the bottom. Adults will receive a Divine Mercy holy card with the Act of Consecration of the Family to The Divine Mercy prayer on the back. The program will conclude with the recitation of the Chaplet of Divine Mercy. Parents, homeschool families and anyone unable to attend the evening programs are warmly invited. Each classroom will be given a FREE 11 x 14 Divine Mercy Image. Each student will receive a BLESSED 5 x 7 Divine Mercy Image to take home. Accented with a blank ribbon, this holy card is designed for the student to fill in “Jesus, I Trust in You” on the bottom of the card, allowing them to make a personal commitment to trust in the Lord.